Standing Ovation is a superior selection of our native little bluestem grass. Little bluestem grass is native to the prairies of North America. It is a warm season grass, greening later in the spring than your blue grass lawn, but tolerating the heat and drought of the summer better. It prefers full sun and soil on the dry side. 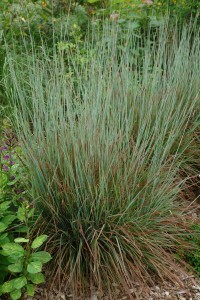 Little bluestem is better suited for our high and dry environment than other overused ornamental grasses. Standing Ovation was selected for its superior tight, upright habit. It remains uniform in the landscape, giving your garden a much cleaner and formal appearance. Standing Ovation little blue stem is a clump forming grass, so it does not run and become weedy in the garden. During the growing season it has superior bluish green leaves turning to shades of purple at the base. Summer brings on the tall flowering spikes, followed in the fall with fluffy white seed heads that are a good food source for many local birds. The blue and purple summer color changes to spectacular oranges in the fall. The foliage stands tall through most winters, giving much needed winter interest and texture. The bronze cast of the winter foliage looks stunning against a fresh snow. This grass keeps its good color through the winter until it is cut to about 3” from the ground in the spring, allowing for fresh new blue foliage to emerge. Standing Ovation grows best in full sun and drier soils and pairs nicely with the prairie native Chocolate flower (Berlandiera lyrata) and selection of the Mexican native Vermilion Bluffs® sage (Salvia darcyi ‘Pscarl’). Brought to Plant Select® by North Creek Nurseries. I love this plant, but have a lot of shade. Will it grow in part shade? I live in Minnesota. It is a great plant! However, it does not like shade. It will flop. Full sun is best in MN. I am thinking about planting the Little Blue Stem. I am worried that the seeds will take hold in the surrounding rock area next to the area I want to plant. I don’t want new plants showing up in the rocks every summer. I haven’t seen any information of the reseeding of ornamental grasses. Plant select needs to inform the gardener of the invasion of new unwanted plants. Should I be concerned about this plant? Great questions! You should not have a yearly problem with this plant. If you plant masses of them you will definitely get more seeding around that you may have to address every 3-4 years, but if you are planting 1 plant you may not see any seedlings for many years. Concerning introducing weeds and gardening with plants that may like to seed around, Plant Select has protocols that are followed through the trialing process. You should see how many fantastic plants didn’t make it into the program because they were deemed a bit weedy. However, plants can behave differently in different conditions in different gardens and that’s why we experts who have experience that monitor the thresholds of plants that seed around and demonstration gardens around the state that share input on them too. For some gardens, slightly weedy plants are nice and they fill in the empty spaces. For biennials and short lived perennials one has to allow that to continually enjoying the plant year after year. Enjoy this lovely native plant, it will be a low maintenance garden plant for you. Thank you for this site. I am heading a multi-phase renovation project from traditional landscape to xeric/xeriscape in our HOA. this website has been a great help to me. We hope to do more with HOA’s offering guidance for landscape conversions to xeriscapes and becoming demonstration gardens.